Company Profile: Weaver Popcorn makes raw, already popped, and microwave gourmet popcorns. 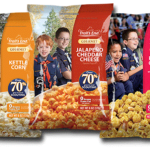 In addition to its Pop Weaver retail products, the company packages popcorn under the Trail's End name for Boy Scout fundraising, and also offers products for private-label and concession customers. Weaver owns and cultivates farmland in the US and Argentina and grows its own specially bred hybrid corn. With popcorn as its only business, the company produces about 30% of the world's popcorn, second only to ConAgra Foods. The family-owned-and-operated company was founded in 1928 by Rev. Ira E. Weaver. Challenge: An important aspect of fundrasing activities is the recognition that volunteers earn with their personal sales accomplishments. Thus, the application of e-commerce to non-profit fundraising required a personalized selling approach that had never before been done in an online environment. We had to develop a system with the proper safeguards for underage minors to sign-up and easy to use tools to allow them to create personalized online sales pages and to share those pages with family and friends through social media and personal email. Solution: We developed an online participation system connected to back-office membership authentication system to safeguard and manage the enrollment of participating scout troops. We then developed online tools to allow participating scouts to create a fun and engaging personal sales page. We provided a means of associating scouts with their participating troops so that sales could be tracked and recognized by individual participant, by troop, pack and region. And we provided easy to use tools to make sharing scout's sales pages with friends and family by email and social media simple and easy. Results: Weaver reported a 700% increase in sales during the first season of use on the online sales platform. Equally important, Weaver was recognized for its visionary leadership in ushering in the use of new technology that contributed significantly to scout safety and scout family convenience for participating in this important fund raising activity. Company Profile: Lee Jeans, operated by VF Corporation, the largest global branded lifestyle apparel company in the world, is an international retailer and manufacturer of denim and casual wear. Henry David Lee began sewing work apparel in Salina, Kansas in 1912 and in 1913 introduced the Union-All work jumpsuit which quickly made Lee a household name. Lee strives to bring more fits, styles, finishes and features than ever before to the denim apparel market. Challenge: Lee's primary challenge was two-fold. First, they did not want to antagonize their vast brick and mortar retail market. In order to accomplish that task, they decided to only introduce select lines in their first online e-commerce venture. And they wanted each brand to have its own web presence. We worked with Lee's agency, Barkley, to develop a multi-store, single checkout concept which we presented to Lee as a way to meet their retailer relations objectives while also catering to the convenience needs of their customers. This was to be Lee's first direct to consumer selling experience so we were also called upon to collaborate with Lee operations personnel to develop the necessary processes for order management and order fullfillment. Results: Lee was the first global apparel brand to risk its brick and mortar distributor relationships and expand into online e-commerce. Within the year, other similarly situated retailers, including Levi, had followed suit. Our entire team was very proud of being selected to partner with Lee and Barkley to help accomplish this important breakthrough in online retailing. Company Profile: Millbrook Distribution Services, formerly a division of McKesson Corporation, now owned by United Natural Foods and operating as UNFI Specialty Distribution Services, is a leading wholesale distributor of ethnic, natural, organic, kosher, and gourmet foods. The company also distributes general merchandise, such as health and beauty items and has distribution centers in Arkansas, Florida, and Massachusetts. The company employs approximately 350 field sales personnel representing about 75,000 products to some 7,800 independent store retailers, regional and national supermarket, mass merchandisers and chain drug stores throughout the US. Challenge: Millbrook represents hundreds of different manufacturers with frequently changing product and promotional offerings. Millbrook’s large field sales force operates in a competitive environment for valuable shelf space. In order to ensure that field sales personnel had accurate, up-to-date inventory data Millbrook was printing inventory reports of hundreds of pages and sending them via overnight courier to each of its 350+ sales reps each week. Solution: Millbrook’s internal IT team developed an interface to their internal inventory management system to pull data and transfer it to a secure web server. Our team developed a web interface allowing Millbrook’s field sales personnel to access complete up-to-date, searchable inventory data on all of Millbrook’s 75,000 plus item inventory from the field. Sales personnel were equipped with VPN access to web services middleware application that provided a robust inventory information system at their fingertips. Results: Inventory related order errors were reduced by more than half and sell through on promotional offers was increased. Millbrook’s brand value was substantially enhanced through the use of cutting-edge technology aimed directly at better serving its customers. In addition to enhancing the ease and extent of data available to the field reps, the company saved an estimated half million dollars in the first year. Company Profile: Up, also known as Up TV, Uplifting Entertainment (formerly GMC TV and originally Gospel Music Channel) is a cable television network founded originally with a focus on gospel music. As of August 2013, approximately 60,858,000 American households (53.29% of households with television) receive the channel. Challenge: GMC was in a period of rapid growth and expansion of its business operations including the acquisition of subsidiary business units and development of strategic joint venture partnerships. Acquisitions had brought in several subsidiary publishing businesses supplying rich media products to the pastoral industry for use in enhancing church sermons. In addition to operating their own independent branded sites for these products, they also entered into a joint venture with a major Christian publisher to cross-sell the products on the publishers site. GMC needed a multi-site solution that could also be integrated to push and pull products from its joint venture partner’s inventory. The system had to support custom pricing and segregated accounting and reporting functions. GMC did not have the internal IT resources to manage the development of the necessary e-commerce system and they sought out an experienced partner to assist them with the selection, customization and implementation of a solution for these important new business ventures. Solution: Ahhhaweb personnel provided complete project management services to meet GMC’s objectives. Our team evaluated the needs of GMC’s business and reviewed solution options, negotiated pricing and managed the contracting process. GMC’s design team provided general guidelines for the layout of the site with our team managing the design process. GMC provided product data and our team managed the data transformation and import of product data for the solution. Our team worked directly with GMC’s joint partner publishing house to orchestrate the integration of bi-directional data feeds between the GMC master database and the publisher’s system. Results: GMC’s sites launched on-time and on budget without distractions to the GMC business operations. The selected platform and solution design provided the flexibility needed to effectively accommodate GMC’s rapidly evolving business. Company Profile: Beloit is a manufacturer of industrial paper making systems and machinery. Beloit’s history dates back to 1858 when the company was founded as Beloit Iron Works. The company began producing papermaking machinery and parts in 1887 and the company eventually grew to employ approximately 8000 people worldwide. Challenge: Beloit’s products require specialized maintenance support which is carried out by Beloit’s field engineers. Beloit needed a contact management system to facilitate sharing information across the field between engineers and sales personnel as well as with the home office. Solution: Ahhhaweb developers built a custom, web-based CRM system specific to Beloit’s needs. Results: Sales immediately jumped more than 10% as field sales personnel had access to up-to-date maintenance records and were able to more pro-actively address the needs of Beloit’s customers. Additionally, time and cost savings were achieved by eliminating calls that were unproductive. Sales management gained increased control over field sales activities helping the company to further fine tune its field operations. Company Profile: The Schwan Food Company is a multibillion-dollar, privately owned company with 17,000 employees in the United States. Based in Marshall, Minnesota, the company sells frozen foods from home delivery trucks, in grocery store freezers, by mail, and to the food service industry. The company produces, markets, and distributes products developed under brands such as Schwan’s, Red Baron, Freschetta, Tony’s, Mrs. Smith’s, Edwards, Pagoda Express, and many others. Challenge: Schwan’s gourmet home food delivery service had started in 2003 as Schwan’s Select. In 2004 Schwan’s decided to rename the line to Impromptu Gourmet and to launch its first e-commerce sales venture. Because direct to consumer sales is a core part of Schwan’s business model and the company expected e-commerce sales to become a major part of its sales methodology they required an extensible and customizable e-commerce solution . Solution: The team at Ahhhaweb was selected to provide the solution based on our work with open-source platforms that could be customized and extended to support unique business processes. The e-commerce system was integrated with Schwan’s back office ERP system to provide automated order fulfillment capabilities, allowing the business to grow without added friction. Results: Schwan’s went on to expand its e-commerce activities across its home delivery product line via an integrated e-commerce system. The Impromptu Gourmet brand experienced a doubling of revenue every year until the business was sold. In 2010 Schwan’s reported a conversion rate exceeding 40%. Company Profile: Russell Manufacturing Company was founded in 1902 by Benjamin Russell. With legacies like the invention of the sweatshirt and outfitting great athletes for generations, Russell Athletic has played an integral role in developing performance wear that delivers for more than 100 years! Combining the old with the new, Russell Athletic continues to create modern-day classics for everyday athletes. Solution: Russell Athletic had an effective inventory management system in place for supporting existing operations. We didn't want to necessitate any changes to the existing system so we developed an API that allowed us to detect changes in the master inventory system and update online availability accordingly. We extended the API further to verify available inventory before finalizing online orders and to immediately send decremental adjustments to the master inventory system upon the successful capture of online orders. Results: Russell Athletic was able to extend its ability offer customers access to discontinued product and dramatically extend its market for profitably liquidating such products. Company Profile: Just Keep Livin is a 501(c)(3) foundation operated by Matthew Mcconaughey and his wife Camila that is dedicated to empowering high school students by providing them with the tools to lead active lives and make healthy choices for a better future. The Just Keep Livin foundation partners with schools and other non-profits in local communities to implement after school fitness and wellness programs in inner-city high schools. Through these programs the foundation seeks to encourage students to make positive life choices to improve their physical and mental health through exercise, teamwork, gratitude, nutrition and community service. Challenge: To help support the wok of the foundation, Mcconaughey entered into a licensing agreement with clothing supplier GNA International to market a line of t-shirts and other casual wear featuring the "Just Keep Livin" brand. A part of their marketing strategy was centered around the ability to quickly introduce a new design and change the line up frequently. They didn't want to have something offered in their webstore that was no longer available or being produced so real time inventory control was critical. Solution: We worked with their ad agency, the TMV Group, and developed a Magento based web store with a bi-synchronous EDI connection with their supplier, GNA International. We trained and supported JKL's partner, GNA International, in order management and returns and refund processing to help make certain that the online store was well managed and responsive to customer needs.